There are many ways that patient centricity could be delivered when doing a health technology assessment (HTA). 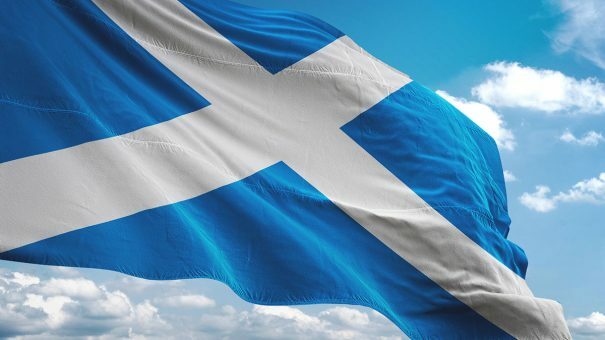 The Scottish Medicines Consortium (SMC) – who make recommendations on the cost-effectiveness of new drugs for the NHS in Scotland – introduced Patient and Clinician Engagement (PACE) as part of a suite of ways to capture patient (and clinician) perspectives when they conduct their assessments. First introduced in 2014, what difference is PACE making? The SMC has a number of ways that patients and their representatives can get involved in the decision making process, the most obvious being through filling in a template and submitting their views to the SMC. In the case of treatments for end of life and very rare conditions, there is the possibility of an additional step in the overall process – PACE. PACE is just another way the SMC approach differs for orphans compared to other drugs; SMC also have modifiers that provide flexibility in their decision making for orphan medicines. SMC describes how PACE involves a meeting that only includes SMC representatives, clinicians and patient group representatives. The meeting allows for a discussion on the benefits of a medicine that may not be fully captured in the conventional assessment undertaken by SMC. PACE meetings result in a PACE statement, agreed by all participants in the PACE meeting. The PACE statement goes forward to be used by the SMC Committee that will make the recommendation on the drug. PACE is only an option when it looks likely that the SMC will not recommend a drug, and when the company requests it. The SMC has reported on the impact of PACE in the past. They noted back in 2016 that 57 medicines had been assessed by SMC from October 2014 – when PACE first applied to decisions – to July 2016. The acceptance rate was 75%; that compares to an acceptance rate for orphan and cancer medicines of 48% between 2011 and 2013, before PACE was introduced. But what has happened since then? PACE has been keeping SMC busy (figure 1). This is, in part, because of a catch up process where companies were able to resubmit to make use of the PACE process when their drugs had been assessed before PACE was available. However, with 2018 seeing over 30 PACE processes, it’s likely more to do with the demand for PACE driven by the drugs coming to market. 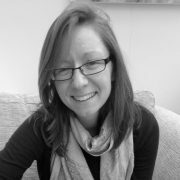 Although no formal analysis has been undertaken for repeat customers, there will be companies and some patient organisations who have done more than one, perhaps suggesting that they find them worthwhile? This is particularly the case for patient organisations since companies don’t play a very active role. They can put in a further written input, but patient organisations need to put in the effort not only for a further written input, but also attend (in person or over the phone) an additional meeting, and agree the consensus statement. That effort needs to be worthwhile. It’s difficult to tease out just what difference PACE has made to SMC decisions based on publicly available data, but a simple pre-post comparison before PACE was introduced gives an idea (Figure 2). This comparison though mixes all types of drugs together diluting the impact of PACE since only a proportion of SMC recommendations relate to end of life/orphan drugs and it is only these for which PACE can be used. SMC’s publicly available data does now have a flag for end of life/orphan drugs, but this only goes back as far as 2014 so it can’t be used to enable the type of comparison that the SMC in-house work has done to compare acceptance of end of life and orphan drugs pre and post PACE (not unless you go through and manually tag over 1,000 recommendations, a tall order). SMC’s flag for end of life/orphan drugs can, however, be used to see if PACE is always used for end of life/orphan drugs and the distribution of recommendations. 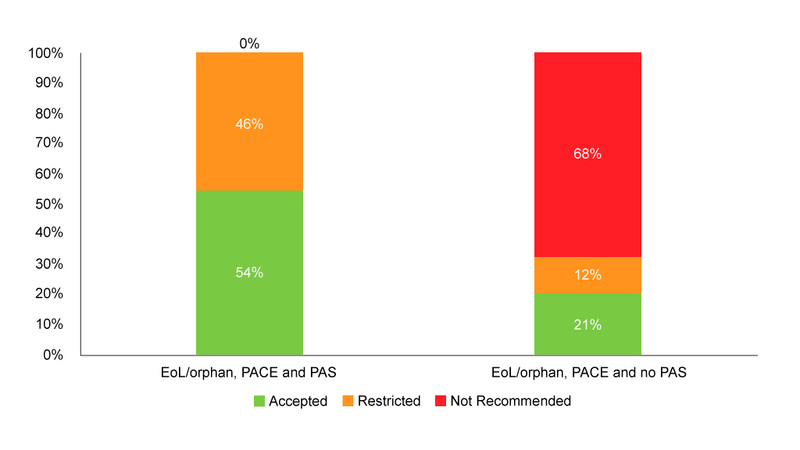 Analysis shows that PACE is used in the vast majority of end of life/orphan drug assessments (94% of them), and although it’s very small numbers, those that don’t use PACE fare better (Figure 3). That’s likely to reflect the fact that PACE is only an option when the SMC looks like it won’t recommend. When PACE is used, it hasn’t always been enough to tip the SMC over into a wholehearted yes, but it may have helped avoid an outright no – although that still happens in one in five end of life/orphan drugs looked at. 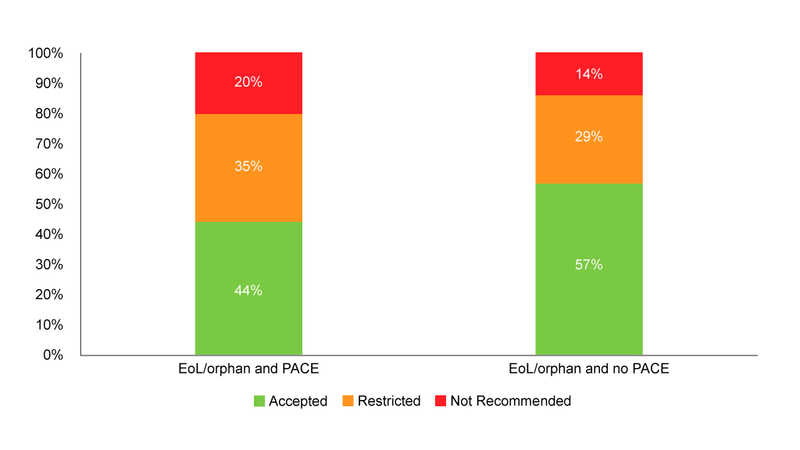 Just looking at end of life/orphan drugs with PACE gives an acceptance rate (including both accepted without restrictions and accepted with restrictions) of 79%, a little higher than the acceptance rate quoted by the SMC back in 2016. 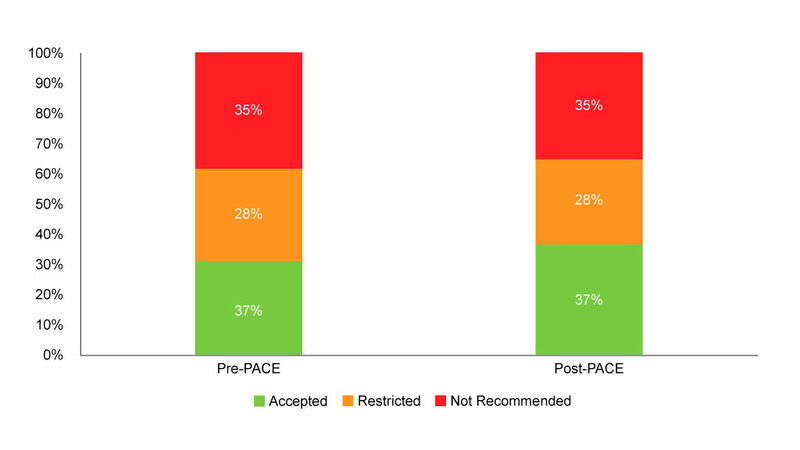 Of course, PACE is but one of the drivers for the SMC recommendation. Other factors, and cost-effectiveness being key amongst them, will play their role too. 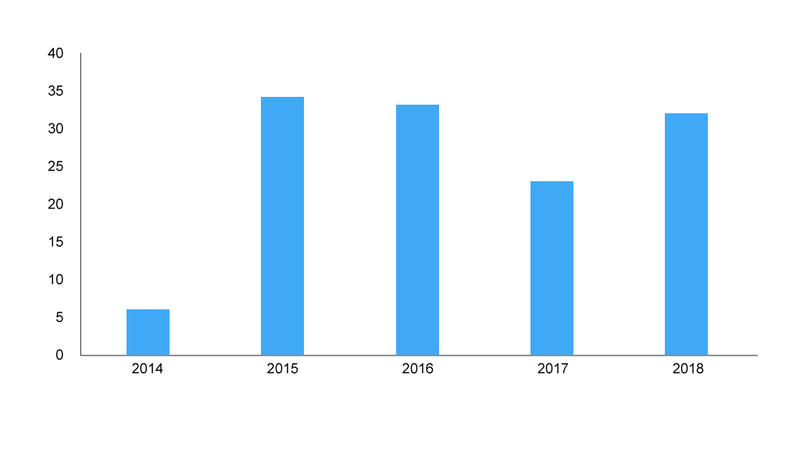 The number of patient access schemes (PAS) – typically a confidential agreement on a price discount – has been rising over time, and these have also been used alongside PACE (figure 4). It also seems that having a PAS can make a difference when used in conjunction with PACE (Figure 5). PACE it seems is keeping SMC busy – raising perhaps resourcing questions, which in part, other HTA agencies are addressing by charging companies for their assessments, as the National Institute for Health and Care Excellence (NICE) will be – and it is playing a role in enabling access, albeit access when prices are also arguably more patient centric by being lower.